Each month of so, I check the Microsoft Azure Datacenter IP Ranges file for new regions. This month, I noticed that the France Central and France South are included. The Azure Germany regions, Germany Northeast and Germany Central, are managed under a trustee model by T-Systems. This is like that of Azure in China. I hadn’t seen the German regions IP ranges before, but last week I found the file: Windows Azure Datacenter IP Ranges in Germany. 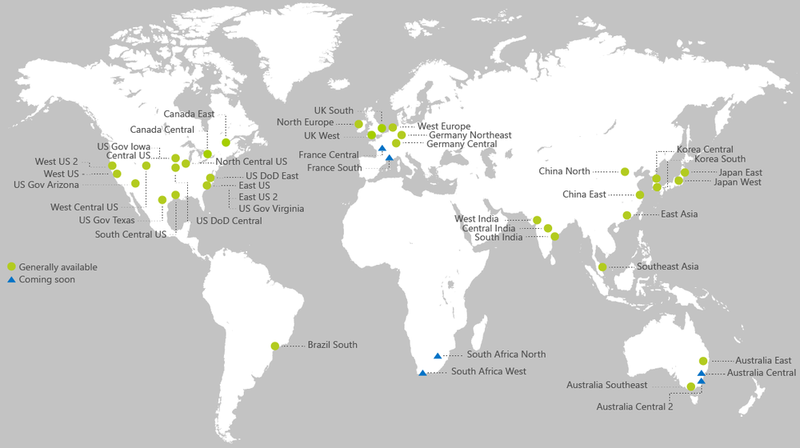 My goal always was to support every available Azure Region, as such, I've now included these regions. I must admit, I didn’t fully design this module to be future proof, I assumed all regions would be included in a single file. I first included Azure in China in version 0.8, with the -ChinaRegion parameter. While functional, this wasn’t future proof. To offer support for Azure Germany, version 0.8 includes some breaking changes in the Get-MicrosoftAzureDatacenterIPRangeFile CMDLet. Standard: the default value, downloads the Microsoft Azure Datacenter IP Ranges file. If you were separately downloading the China region file, you'll need to ensure that you update your scripts logic. I've also tweaked Get-MicrosoftazureDatacenterIPRange. The first change was to add support for the extra file to download, and the parameter change. I've also modified the logic around how the CMDLet stores the region information. I don’t expect these changes to cause any issues.